Non-Dominicans applying for residency and cédulas (ID cards) in the Dominican Republic, who must present up-to-date proof of having no criminal record in their home country as well as in the Dominican Republic. Persons applying for employment in the DR and overseas are asked to produce proof of having no criminal record, especially if the sought employment involves working with children or vulnerable people. Whilst commonly referred to as Dominican good-conduct certificates, the documents are officially called Statements of no Criminal Convictions. Partial copy of a redacted Dominican good-conduct certificate. as part of the apostille process. The process takes us about two weeks from start to finish. 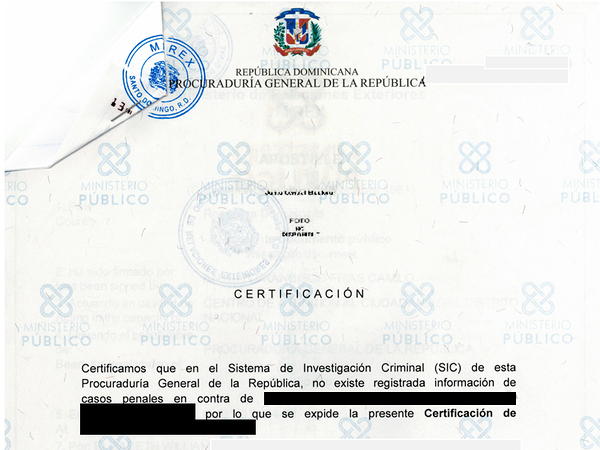 Our service includes the certificate's legalization, and the apostille from the Dominican Foreign Ministry. If you are Dominican we require a copy of your current valid ID card (cédula), if you are a foreigner we need a scanned copy of the information page from your current valid passport which contains your photograph and relevant data. 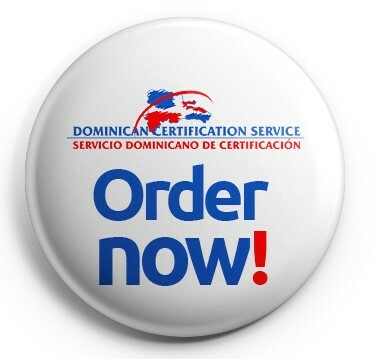 If you have any other questions, please just contact us on info@dominicancertificates.com.